The present study is to determine the potential of gas industry sludge as a low-cost adsorbent for the removal of cadmium from aqueous solution. The batch experiments were conducted to optimize pH, contact time, adsorbent dose and initial metal ion concentration. The experiments were optimized at pH 5, contact time 60 min and an adsorbent dose of 0.75 g/100 ml with constant agitation at the room temperature. The result of batch experiment was further discussed for the removal of cadmium from adsorbent. The adsorption data were correlated with Freundlich and Langmuir isotherms to know the interaction of sludge adsorbent with cadmium. 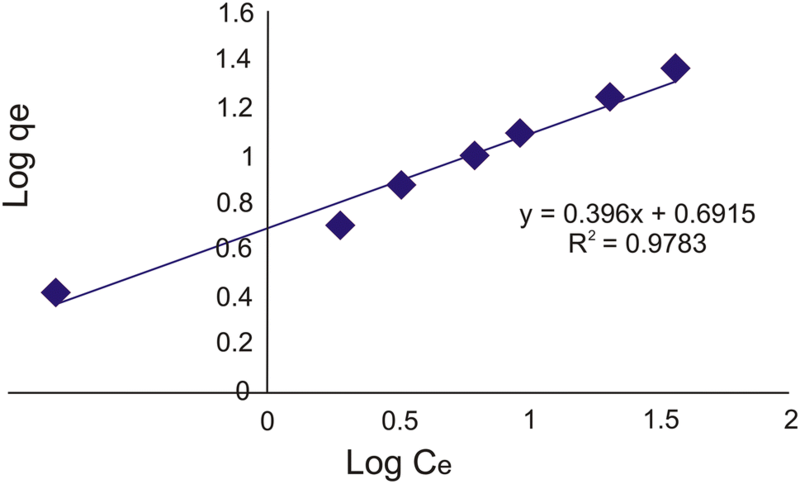 High value of regression coefficient (R2 > 0.95) indicated that the adsorption data are fitted well with both Langmuir and Freundlich isotherms. The adsorption capacity of 25 mg/g was found to be quite good for removal of the cadmium from aqueous solution. Desorption efficiency showed highest removal with HCl (42.83%); followed by HNO3 (38.26%), EDTA (37.73%) and H2SO4 (36.83%). The removal and desorption efficiency of the gas industry-based adsorbent was found to be comparable and even more suitable than the chemically modified adsorbents. The present study provides a low-cost and environmentally friendly adsorbent, which can be used as an alternative for the treatment of wastewater. Heavy metal pollution is a major environmental concern at the global scenario and has limited the availability of fresh water for the increasing population [1, 2]. The changing water quality has become a serious problem for the entire nations of the world . The heavy metals are non-biodegradable, cause damage along the trophic level and create serious problems due to their persistence, toxicity and bioaccumulation nature [4, 5, 6, 7]. Some of the heavy metals are biologically essential and act as a micronutrient for plants and relatively harmless, but some are purely toxic (i.e. arsenic, beryllium, cadmium and lead). These include metallic elements having atomic weight in the range 63.5 and 200.6 g mole−1 with a specific gravity greater than 5 g cm−3 . The heavy metals are contributed by different sources, and their high concentration may cause serious health hazards [9, 10]. Cadmium (Cd-II) is one of the heavy metals having main sources such as the wastewater, industrial effluents, paint, plastic, synthetic fertilizer, metal coatings industry , atmospheric deposition and rocks . This metal is very harmful, and the human being is susceptible from residential or occupational exposure even at very minute concentration (0.5 mg/L). High level of cadmium in the wastewater may lead to various ailments . International Agency for Research on Cancer (IARC) has classified that the cadmium and its compounds are carcinogenic in nature . The ingestion and inhalation of cadmium may cause dysfunction of the kidney and severe damage to the lungs; and instead, its chronic exposure may lead to death [1, 15]. A high proportion of cadmium in the soil may produce oxidative stress and nutritional deficiencies [16, 17, 18]. The wastewater treatment has become a worldwide problem and concern for the policy makers and environmentalists . Various conventional physiochemical processes are used for the removal of heavy metals from wastewater such as coagulation, flocculation , precipitation , adsorption , membrane filtration , electrolysis , photocatalytic degradation , ion exchange , oxidation, reduction  and solvent extraction . Different researchers have indicated the strength and limitation of these techniques [1, 29, 30, 31]. Among these, adsorption method does not require a huge input of chemical reagents that create other environmental and health problems to deal with secondary pollutants. Adsorption studies have investigated the low-cost adsorbents from agricultural and industrial wastes and found them to be much effective for the removal of heavy metals from wastewater [32, 33, 34]. 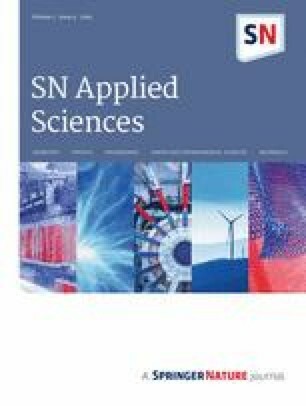 Some of these studies modified the adsorbents with various chemicals to increase the sorption capacity [29, 35, 36], but still there is a stringent need to explore low-cost and high-potential adsorbent that could have appreciable removal efficiency and desorption capacity for the recovery of heavy metals from the wastewater. In the present study, the gas industry sludge has been used without any chemical treatment to prepare gas industry-based adsorbent (GIBA), which was further used in a batch experiment for the removal of cadmium (Cd-II) from aqueous solution. 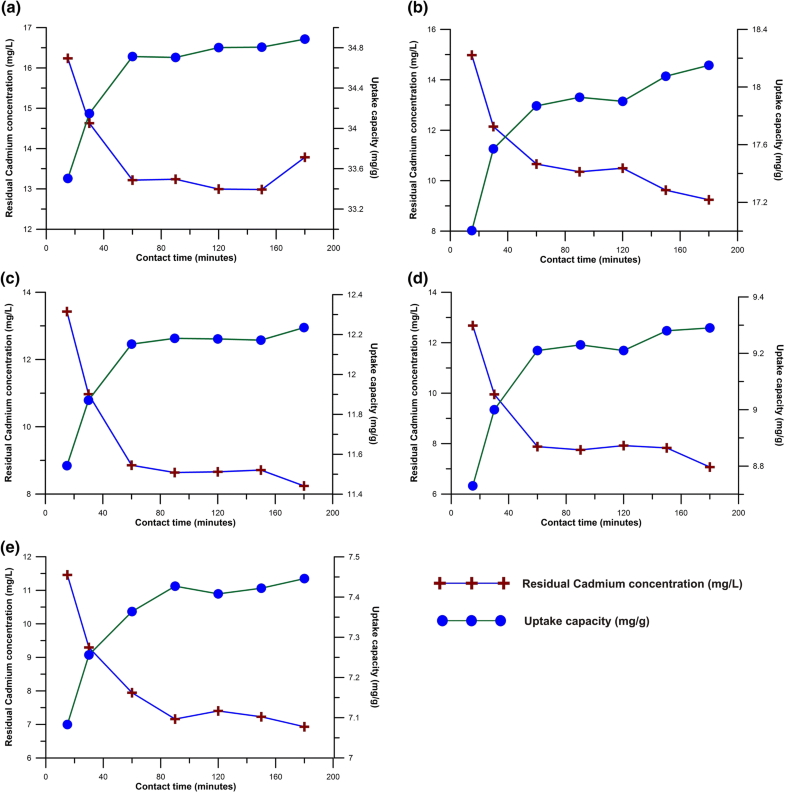 The study covered a series of batch experiments for the optimization of pH, contact time, adsorbent dose and initial metal ion concentration; followed by the desorption process to check the reusability of adsorbent for further use. The Langmuir and Freundlich isotherms were used to describe the adsorption of Cd-II on the adsorbent. Thus, the present study aims to explore the potential of gas industry sludge for the removal of heavy metal from synthetic solution of cadmium. The adsorption isotherm provides input to better understand the interaction of adsorbate on the adsorbent that can further be helpful to design the batch system for wastewater treatment. The sludge samples were collected from Indraprastha Gas Limited, New Delhi, India. The samples were transported to the laboratory and kept in oven at 103 °C for 24 h and thereafter grinded using agate mortar. Then the samples were sieved, marked as gas industry-based adsorbent and stored in desiccator. 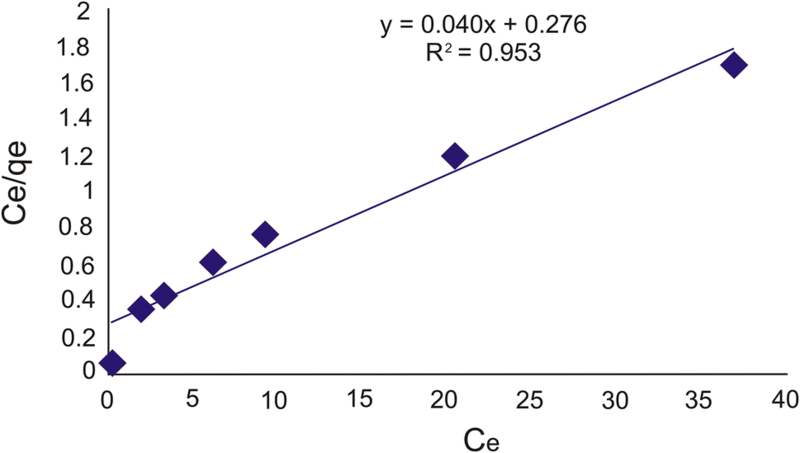 where Qup is the uptake capacity of Cd-II adsorbed on the GIBA, C0 is the initial concentration (mg/L) of the Cd-II in aqueous solution and Cf is the final concentration of the Cd-II after using v (volume) of the metal solution (L) with M (mass) of adsorbent (g) used in the experiment. The adsorption of cadmium (Cd-II) using GIBA in the present study was found to be varied at different pH levels, which has also been reported by many researchers using different types of adsorbents [12, 40, 41]. The pH value was optimized for the present batch experiment. The per cent removal and uptake capacity (mg/g) at different pH levels are shown in Fig. 1. There is an increase in removal and uptake capacities of Cd-II up to pH level of 5. The per cent removal and uptake capacity at this pH value were found to be 85.69% and 88.07 mg/g, respectively. 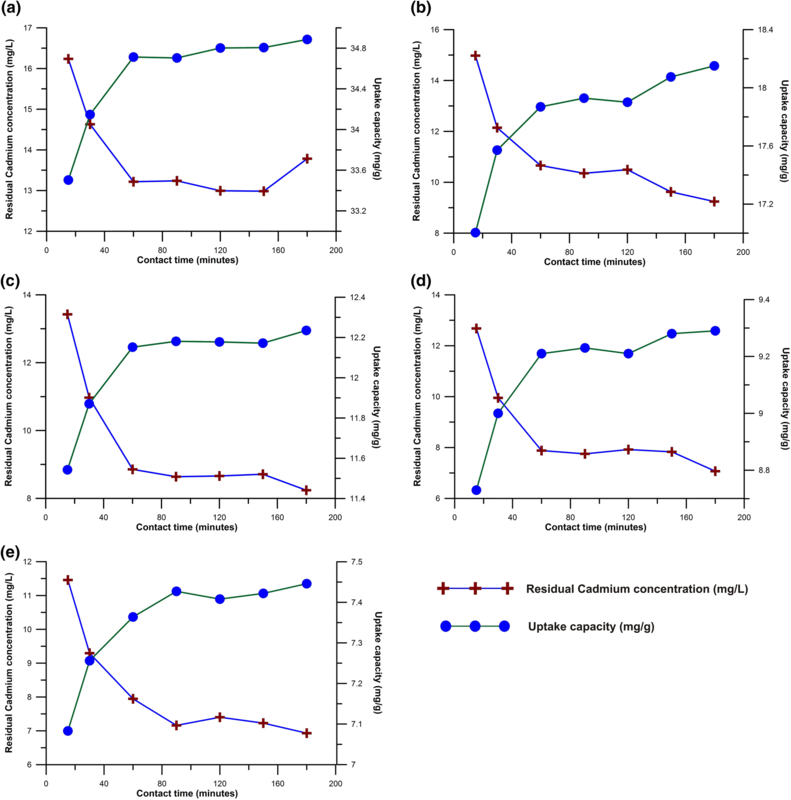 There was no appreciable change in the uptake and removal capacities that helped to select optimum pH 5, and thereafter, the increasing pH level was considered less economically viable. 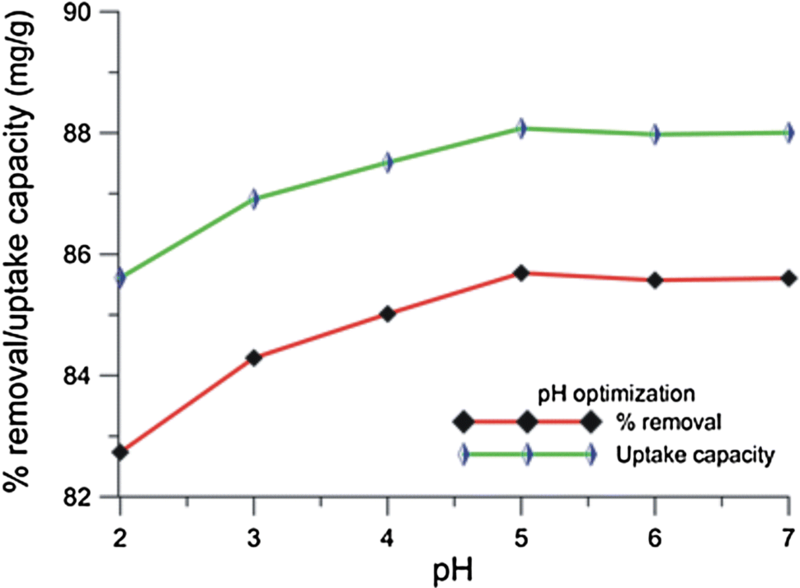 Adsorption studies conducted by many researchers with cadmium also showed optimization level close to pH 5.0 [32, 42, 43, 44]. To study the effect of adsorbent dose and contact time, the batch experiment was conducted at initial cadmium concentration of 100 mg/L, optimized pH (5), temperature (30 °C) and agitation speed (150 rpm). The adsorbent dose was found to be varied from 0.25 to 1.25 g/100 ml and contact time from 15 to 180 min, respectively. The result revealed that the adsorption rate increased from 83.761 to 87.215%, when contact time was increased from 15 to 180 min at the adsorbent dose of 0.25 g/100 ml. Also in the similar time frame, an increase in per cent removal was observed from 85.021 to 91.345%, 86.575 to 91.760%, 87.32 to 92.93% and 88.542 to 93.070% at 0.50, 0.75, 1.00 and 1.25 g/100 ml dose of adsorbent, respectively (Fig. 2). Figure 3 shows that the uptake capacity increased from 33.504 to 34.886 mg/g, 17.004 to 18.151 mg/g, 11.543 to 12.235 mg/g, 8.73 to 9.29 mg/g and 7.083 to 7.446 mg/g at 0.25, 0.50, 0.75, 1.00 and 1.25 g/100 ml dose of adsorbent, respectively, when contact time was increased from 15 to 180 min. There was no appreciable increase in the removal per cent for cadmium after 60 min. It was observed that the per cent removal of cadmium from aqueous solution increased with increase in adsorbent dose from 0.25 to 0.75 g/100 ml. However, such an increase in per cent removal was not observed after increasing the adsorbent dose. 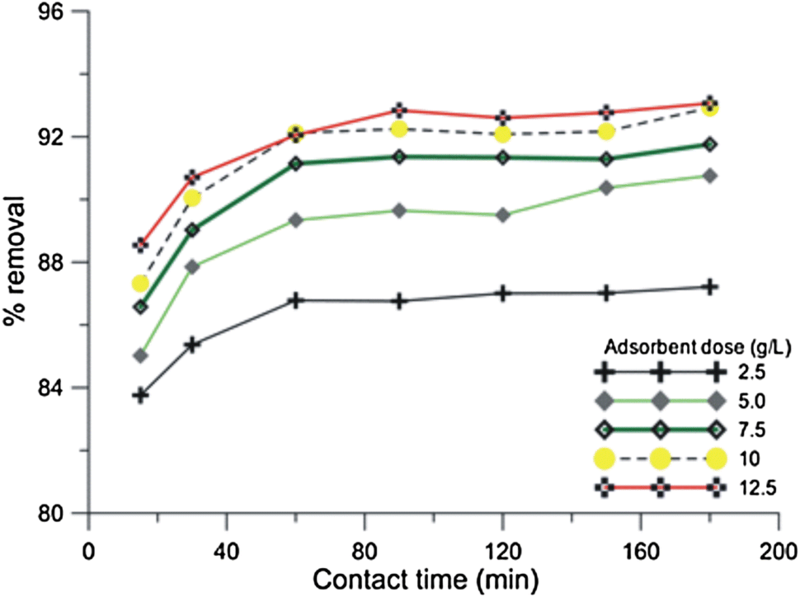 This was due to “solid concentration” effect, which explains that the quantity of a metal adsorbed per unit quantity of adsorbent decreases significantly with increasing the mass of adsorbent per unit volume . It was observed that the concentration of cadmium adsorbed on the gas industry-based adsorbent increased with time. During the initial stage of sorption, a large number of vacant sites were available for adsorption. It was also observed that with the increase in adsorbent dose, more surface area became available for adsorption due to increase in active sites on the adsorbent; then making easier penetration of metal ions to the adsorption sites . After a lapse of time, the remaining vacant surface sites occupied difficulty due to repulsive forces between the solute molecules on the adsorbent surface. To study the effect of initial metal ion concentration, the optimized value of pH (5.0), contact time (180 min) and adsorbent dose (0.75 g/100 ml) were used in batch experiment. The cadmium concentration increased from 20 to 200 mg/L, and the per cent removal decreased from 99.24 to 81.58%, whereas the uptake capacity increased from 2.646 to 21.753 mg/g (Table 1). This is because of more binding sites were available at a low concentration of metal ions, but as the concentration of metal ions increased, then the ions started to compete for available binding sites . Recovery of metal ions adsorbed on the adsorbent is one the most important aspects for the development of a successful adsorption process . The maximum desorption efficiency was observed to be 42.83% with gas industry sludge-based adsorbent using 0.1 M HCl as eluent (Fig. 4). The desorption efficiency of adsorbent for cadmium was found to be in the following order as HCl > HNO3 > EDTA > H2SO4. where qe is the amount of metal adsorbed in (mg/g) and Kf and 1/n are the relative indicators of the adsorption capacity. The Langmuir and Freundlich isotherms are plotted in Figs. 5 and 6, which indicated the value of R2 > 0.95. The equilibrium biosorption data followed both Langmuir and Freundlich isotherms with R2 > 0.95 (Table 2). The maximum cadmium adsorption capacity (qmax) with gas industry-based adsorbent was found to be 25 mg/g. The present study was further compared with other studies, which indicated that the GIBA is having appreciable adsorption capacity in comparison with the biosorbent materials and chemically modified adsorbents (Table 3). The batch experiment further revealed that the GIBA is having high removal potential of heavy metal (Cd-II) and can be considered as a low-cost adsorbent for the wastewater treatment. A wide range of adsorbents are used worldwide for the wastewater treatment; however, a search for the low-cost and environmentally friendly adsorbent is still there. Many researchers have inferred the alternative low-cost adsorbents including agricultural and industrial wastes, which can be potentially used for the removal and recovery of the heavy metals. The present study explored the potential of gas industry-based adsorbent (GIBA) in batch experiment after the optimization of various adsorption parameters such as pH, contact time, adsorbent dose and effect of initial Cd-II concentration from the aqueous solution. The adsorption capacity of present adsorbent is found to be very high in comparison to the agricultural by-products and chemically modified adsorbents as well as biosorption. 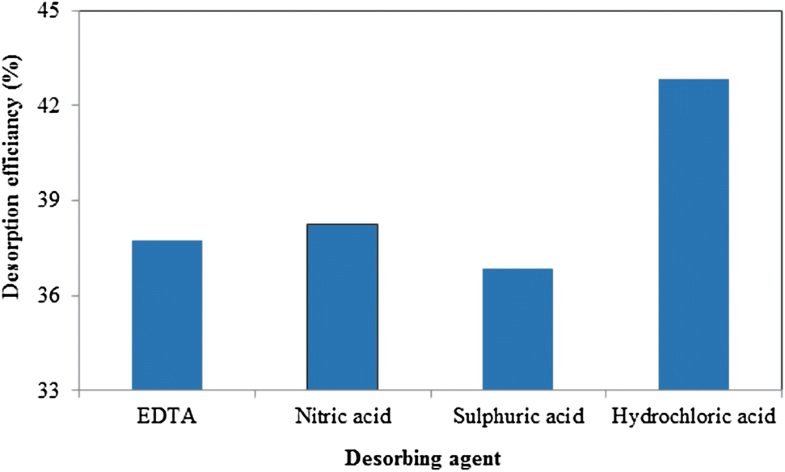 The high removal and desorption efficiency of GIBA from the aqueous solution strengthen its future use as a low-cost adsorbent for the removal of heavy metals from the wastewater. The authors acknowledge the Department of Energy and Environmental Sciences, Chaudhary Devi Lal University, Sirsa, Haryana, India, for providing resource facilities and laboratory analysis.